What’s in a Name? | Andrew Greenberg - The site of game designer Andrew Greenberg. All opinions expressed here are my own and are not reflective of any organization to which I belong. 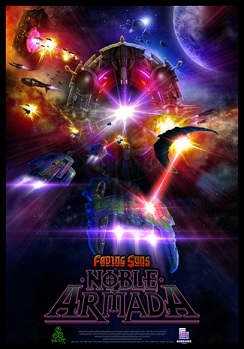 Our working title for the game has been Fading Suns: Noble Armada, but we’ve begun to have few concerns about it. The main issue is that our friends at Ulisses Spiele are getting ready to launch the fourth edition of the Fading Suns rule book, and we don’t want searches for the games to confuse one for the other. The idea is for the games to support each other, not get in each other’s way. We are also getting a number of questions as to whether this is another version of our older Emperor of the Fading Suns game. The idea with a variety of different games set in the same universe has always been to shine lights on different aspects of the setting. EFS took the broad perspective, with you leading one of the most powerful factions in the Known Worlds along its rise to power. The Fading Suns RPG went the exact opposite route, exploring individual stories after the Emperor Wars ended. Noble Armada is a combination of the two. You are a noble, commanding at least one starship and its battle-ready marines and crew. You venture to enemy space and lost solar systems, seeking to expand your house’s power and your own wealth. They are grand stories, but not on the grand scale of EFS. Thus we have decided to change the name to make it clearer what the game is about. We don’t want to call it purely “Noble Armada,” as we began a PC game of that title back in the late 90s and want to revive it someday. Here are our top four titles. 2 Comments to "What’s in a Name?" Noble Armada Tactics or Fleet Tactics sound the most accurate. Lost Worlds is an imaginative title but makes me think more of an exploration/RPG type experience rather than a tactical/strategic game. I’ve always dreamed of an action RPG set in the Fading Suns universe. If only CD Projekt was on board to fulfill my dreams. And the hope of the original Noble Armada lives on! Very cool game, I played the beta/demo way back in the day and it was one of my most anticipated games. I even bought a new laptop in anticipation. Tremendous depth, just like EFS. Thanks for your kind words about the old Noble Armada game we had worked on. One of the reasons we are not using the pure name, “Noble Armada,” is because this game is not the extensive one we planned back in the day. We have literally one percent of the budget for this game that we had for that one. The game we are releasing this year has some roleplaying elements and economy, but nothing like what we were developing then. Keep your fingers crossed that we can revive that.